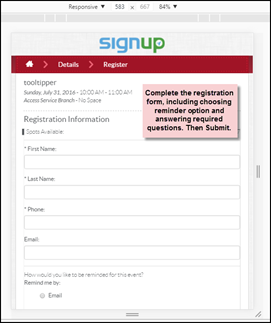 SignUp mobile will auto detect a mobile browser such as a phone. When using a tablet the view will be similar to the desktop view, but will be in a responsive view. 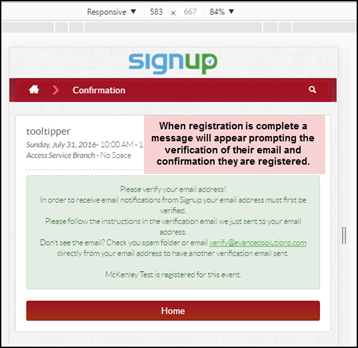 *Branding for SignUp Mobile will be available by contacting Evanced Support to submit a banner image, and to choose a Color Scheme available. ** Note** IF your library has Spaces or D!BS, SignUp will use the same color scheme. 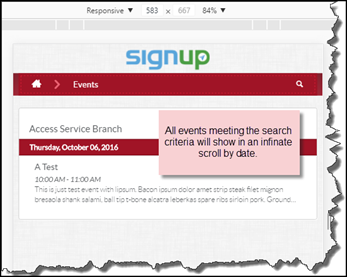 Evanced support will update your site with the chosen color scheme. 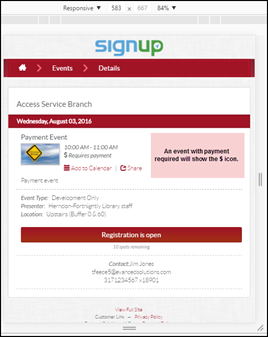 Patrons will now have the ability to use SignUp on mobile devices. 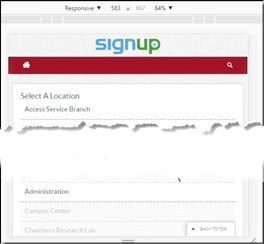 SignUp will now be mobile responsive and adjust by device. It is responsive down to a tablet and can be used on phones. Patrons will begin by selecting their preferred location, which will then show the list of events at the library for that day. 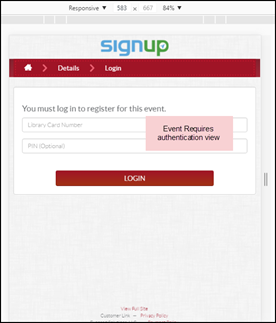 To register, select Registration is open, to register for the event via the registration page, if authentication is required it will prompt for a library card/PIN. 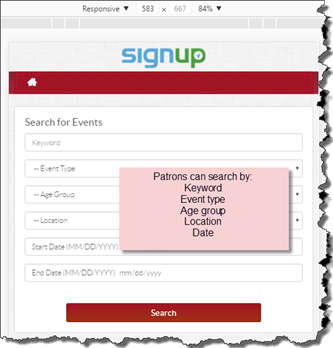 Once a patron is logged in on the device it will save keep the information. 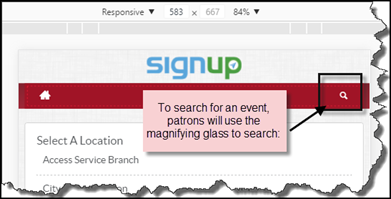 Therefore, a patron must LOGOUT to register a new patron for the event. 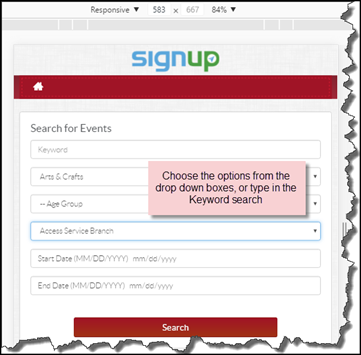 Such as a parent registering multiple children into an event. Each one must be done individually with each library card. The event will show the $ and the words stating Requires Payment. It will show available spots as well as if registration is open. 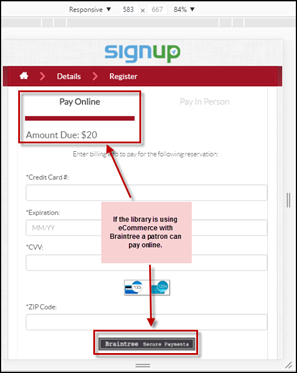 Payment required (library is using Braintree online payment): the patron will have the option to pay online with a credit card or a PayPal account. 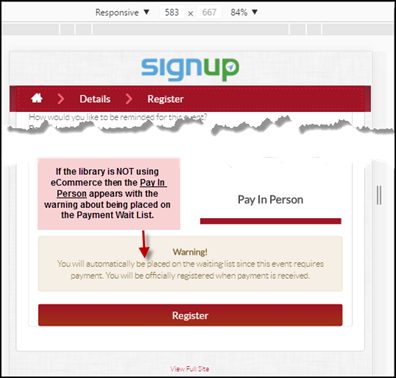 Payment required (library NOT using online payment): the patron will be given the Warning message saying they will be placed on the Payment Waiting List. 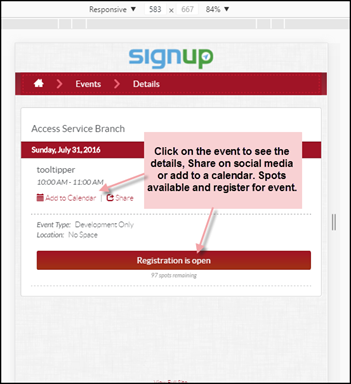 Patrons will be able to search for an event(s) by using the search function in SignUp mobile. 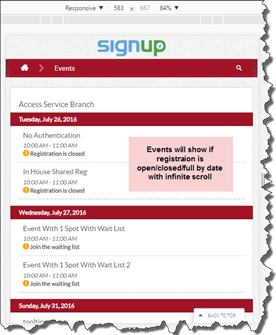 IF registration is required, they would follow the above registration process. Posted - Fri, Jul 29, 2016 at 9:11 AM. This article has been viewed 2500 times.